There’s just something special about grilling out the old fashioned way with a charcoal grill instead of the newer propane grills. Sure the newer propane grills have all the fancy stuff, but there’s nothing like getting back to basics so to speak by grilling with charcoal. 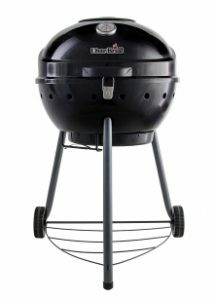 These newer charcoal grills are much nicer than the older ones and give you great tasting food. 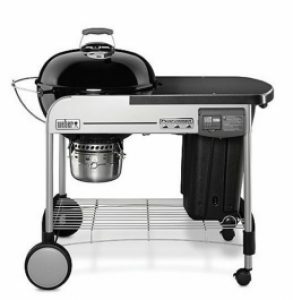 Here we will look at some of the top grills so that you can find the best charcoal grill for you. Its’s not very hard to find a good charcoal grill under $300, $200 or even under $150. With this charcoal grill by Weber, you know you are getting a great grill, Weber is a widely known name and known to make grills that will last you for years to come. This Original Kettle Premium grill is one of the best charcoal grills under $200 out there. It gives you the peace of mind knowing this grill will last. The grill has a 363 square inch cooking area, so you can cook a lot of food at a time and not have to make your guests wait. Let’s say you are having a bunch of friends over for burgers, depending on the size of the burgers themselves, you could probably cook 10 to 15 of them at once with this grill, that’s a lot of burgers. 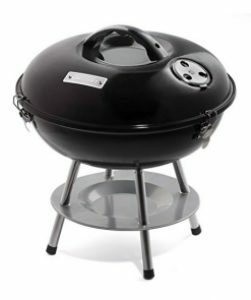 The wheels on the base make it easy to move the grill from place to place and it’s not too heavy, so it’s really easy to push around. 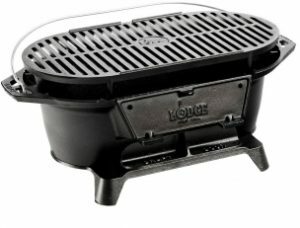 This hibachi style charcoal grill by Lodge is perfect if you like to go on picnics or camping, it would even be good for tailgating. The grill is made of cast iron, so you know it’s durable, unfortunately that also means weight, but it’s not too hard to move around as long as you don’t have to carry it long distances. The cooking grate is 17 ¼ inches by 9 inches, so while it’s not a large cooking area, it’s not too small either. The grate height is also adjustable so you can somewhat control cooking speed and not burn your food. The draft door regulates the heat and is completely removable for easier cleanup. This is a nice hibachi style charcoal grill, take it with you when you go on a picnic in the park and not have to worry about sitting close to a grill some of the parks have. It’s also great to take with you while camping. 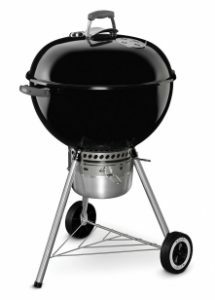 This deluxe charcoal grill by Weber is one of the best charcoal grills out there. It has a table right next to the grill so you can prepare your food right before grilling without having to run back and forth from the kitchen. The 363 square inch cooking area gives you plenty of room to cook a lot of food at once and it’s easy to clean with the one touch cleaning system. The ash catcher is removable to make dumping out the ash simple and easy. It has a built-in thermometer in the lid so you can keep an eye on the temperature to make your food perfect, it has has a detachable cooking timer with a large LCD readout, so you can time your cooking perfectly. 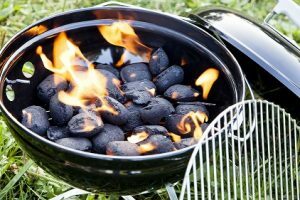 This grill has an electronic touch and goes gas ignition system so you can easily light the charcoal instead of fighting to get it lit and keeps your hands safe at the same time. There is even a handy storage rack under the grill to store things if you wish. This grill is perfect for the backyard and would fit nicely on a patio for backyard grilling. Just bring your food out to the grill, prepare it and then grill it. Char-Broil is another popular name in the grill category, known for making great grills and this one does not disappoint. Being Char-Broil, you know it’s a durable grill and with the 360 square inch cooking area, you can grill quite a bit of food all at once. There is a large, removable ash catcher to make cleaning up and getting rid of the ash simple, easy and you can stay clean. Char-Broil also claims that their system uses less charcoal than other charcoal grills out there to cook the same amount of food. The hinged lid has a temperature gauge so you can keep an eye on the temperature at all times so you won’t over or undercook your food. This really is a great charcoal grill for backyard grilling for the family or for having friends over. There’s enough room to cook a fairly large amount of food, so call your friends and have a party. The Fire Sense Large Yakatori Charcoal Grill is a unique little grill perfect for the patio and small gatherings. The Japanese have always preferred ceramic for more even cooking and that has been incorporated in this grill. It is not aluminum or cast iron, it is ceramic which allows it to distribute the heat more evenly and faster for perfectly cooked food. There is also a lip all around the grill, why a lip on a grill? To keep your hot dogs or other food that may roll on the grill. With a 157 square inch cooking area, you can easily have a family cookout or have a few friends over without having to make any of them wait for the next batch to be done. The ventilation is in the front and can be adjusted, which allows you to control the heat so you don’t cook anything at too high a temperature unless you want to. 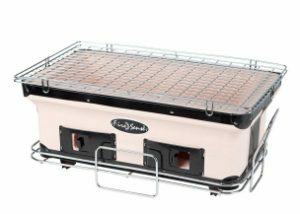 This grill is perfect for your back patio, tailgating or even picnics since it’s easy to move around. It’s also easy to clean up after you are done. 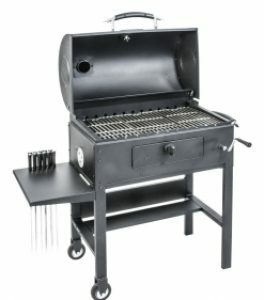 This charcoal grill by Blackstone looks like your traditional gas grill without the propane tank. This 3-in-1 grill does everything you may need it to do whether it be grilling, rotisserie or even a smoker. It has a built-in thermometer so you can monitor the temperature to make sure your food turns out perfect and it has an adjustable coal bed so you can control things. It even comes with 11 heavy duty skewers that are 23 inches long that you can use to make kabobs. In order to use the motor that turns the skewers you will need an outlet nearby. With this grill, you will be able to have all sorts of backyard parties with your friends, make burgers, steaks, kabobs and even ribs. This grill can cook just about everything your heart desires and with the three section grilling grates, you can cook different types of food at once, which is great for parties. The grill is on two wheels, so it can be moved around the yard if needed and the powder coat finish stands up to the high temperatures of grilling and still look brand new. Don’t let the small size fool you, this little Cuisinart portable charcoal grill can cook a decent amount of food for a couple of people. The cooking grate is a little over 150 square inches, so there is plenty of room to grill burgers or steaks for a few people. This portable grill is coated with enamel and there are three locks on the lid for secure movement. The ash catcher keeps the ash from falling all over the ground making it a chore to clean, just dump out the ash catcher after the ash is cooled. This portable grill has a dual venting system to help manage temperature control so your food won’t try to cook too quickly and burn. 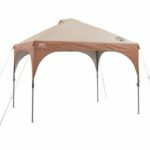 This is great for people living in an apartment with limited outdoor space or to take with you when you go on a picnic or camping. The chrome plated grilling surface is easy to clean and can accommodate up to seven burgers, so if it’s just you and your significant other or you and a few of your buddies, no one has to wait until another batch is cooked. 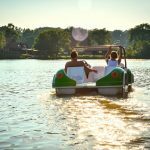 Since it’s small and portable, it can go anywhere and it can be moved by just about anyone since it weighs a mere 2 pounds. So if you’ve always wanted a charcoal grill but never thought you had space, you should really check out the Cuisinart CCG-190, you won’t be disappointed.